I was thinking the other day about how full my makeup bag was. I carry several types of lipglosses, a couple of mascara tubes, a myriad of make-up pencils, a small bottle of perfume and other miscellaneous items. 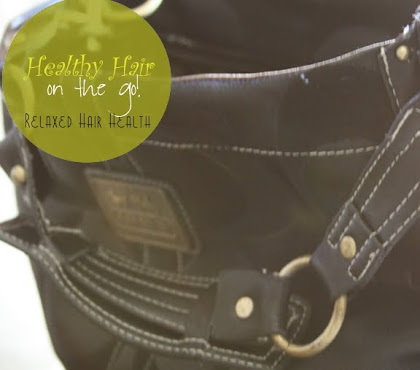 With all the many beauty items I carry with me at all times, I realized that I hardly carry any times in my purse that contribute to healthy hair. My day job requires me to be away from home for most of the day. It's not uncommon for me to leave early morning, returning late-night. Sometimes, I'll pass the whole day without doing anything that benefits the hair.....the whole day. So I determined this was no longer acceptable and decided to take action and create a "healthy hair" on the go kit. I had an extra make-up bag handy so all I needed to do was pick out what items would make the cut. My fatal flaw is the constant incessant need to play with my hair. I know for a fact that this constant manipulation has negatively impacted my retention. This is especially true when I'm doing an activity where my mind tends to wander (like driving or sitting in front of the computer). Well now I've decided that if I can't break the habit, I can at least put something in my hand that will help add some type of benefit to my hair. The answer came in the form of my trusty scalp massager. It's small enough to fit easily into my make-up bag. Putting my scalp massager to work satisfies my craving to always fiddle with my hair. It's like giving a smoker a nicotine alternative that deals with the need to have a cigarette in hand. So while I'm driving, I can have 1 hand (safely) on the wheel and the other hand stimulating and envigorating my scalp. I'm fortunate enough to have an Aveda school in my city. One of the benefits I get to enjoy are the low cost massages, facials, etc. Not too long ago, while waiting to pay for my amazing massage, my eyes wandered to the trial size bottle display and noticed a cute little tube of moisturizer. I was still feeling all "zen" like from my relaxing experience so I grabbed the moisturizer without even looking at the price. I came to find out later that I paid around $8.00 for 0.85 fl oz tube. Had I known what I would be paying for it, I think I would have passed. I'm glad I didn't because I really like how well it moisturizes without weighing down the hair. In fact, I enjoy this product so much that I later bought a full size bottle. So the travel size bottle is now with me where ever I go. Now, whenever my hair needs a little kick of moisture, I've got my Aveda daily hair repair within arms reach. 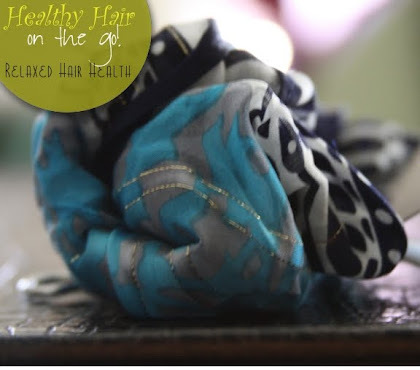 Another way I combat my hands in hair disease is by tying it up under a silk scarf. Often I have to make a 2-3 hour commute from one job location to the other. I've decided to use this time to "refresh" my hair. By this I mean moisturizing and sealing my hair and allowing it all to sink in under the loving care of a silk scarf. This also helps me keep my hands away from my hair so it's a double benefit. In the picture, my silk scarf is folder and held in place with a binder clip. This helps keep it in a small enough size to fit perfectly in my little bag. Gosh, I can't even begin to tell you how often I've forgot to take my vitamins after a long day of crazy hectic-ness. So now I've decided to take my nutrition seriously and pack my Nordic Naturals omega-3 supplements where ever I go. Just having the pills with me serves as a subconscious reminder to stay consistent with taking them. Since my makeup bag is transparent, I'm provided a gentle reminder to take my vitamins every time I'm in my purse (even if I'm just reaching for my cell phone). I also keep a bottle of Cell Food in my purse. One of the benefits of Cell Food is that it can be taken without food. I also like the fact that no refrigeration is required. This product has a ton of health claims. 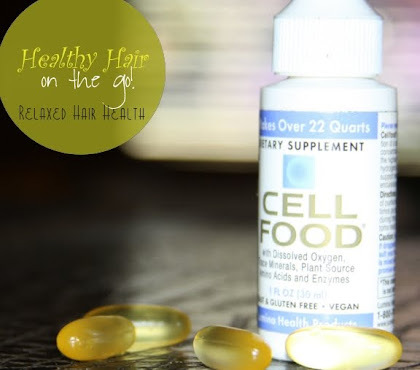 What attracted me most is that Cell Food claims to contain 78 trace minerals and 17 amino acids which are easily absorbed at the cellular level. I've grown accustomed to the strange taste which makes it easy for me to just take off the cap and drop a few drops on my tongue whenever the mood strikes. Next on my list of products to try is their silica formula. You guys may already know but silica is essential for healthy hair, skin, joints, and a healthy heart. The list of benefits to the body from taking silica is just too good to pass up. I'm really in tuned to taking my nutrition to the next level by focusing on readily absorbable sources. This is why juicing is so exciting to me. Cell food goes well with my philosophy of "getting the most bang for my buck" when it comes to nutrition. This also means that I don't have to pack 50-11 vitamins like I did years ago when I didn't know any better. 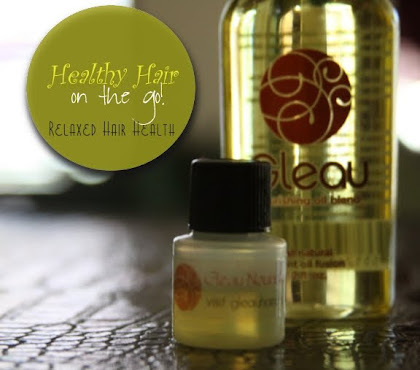 What healthy hair kit would be complete without a small size bottle of Gleau for sealing? I once had a habit of re-applying a light oil to my hair a couple of time throughout the day. I kid you not, I received the most number of compliments on my hair when I maintained this practice. I guess the healthy glow was just too much for folks to look at without saying something positive. So now I ask myself, "why did I stop doing this?" One sure way to get this habit going again is to keep a little bit with me at all times. And because this oil is so light, I don't have to think twice about reapplying when ever needed. My little 1/4 ounce bottle easily fits into the palm of my hand so I can discretely take it into the restroom with me and apply without feeling self-conscious. Although this may all sound like a lot of stuff to be carrying around. It all fit neatly in my bag makeup bag which is around 8.5 inches long, 4.5 inches high. I even had enough room to slip in my tiny spray bottle filled with essential oils. 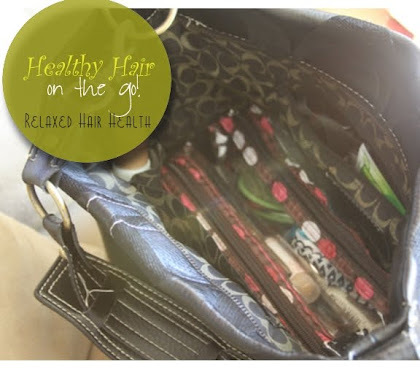 Both this healthy hair kit and my makeup bag are able to fit side-by-side, comfortably in my purse. Now that I'm packed and ready to go, I must focus on the next phase of my healthy hair plan. Before, when I held more of a 9-5 work schedule, I would use my restroom breaks as the perfect opportunity to refresh my hair with product. I was also fortunate enough to have my own office so I could easily break out beauty supplies, when convenient and reapply whenever the mood struck. Because of the routine nature of my work, my actions easily developed into a habit. Now, I barely ever have two days in a month that look similar so I don't have a support structure in place to reinforce a consistent habit. I realize that creating a structure is key otherwise I'll just be lugging around more stuff that I'll never use. I've got some ideas that I'll play around with around how to create a practice of promoting healthy hair throughout the day. 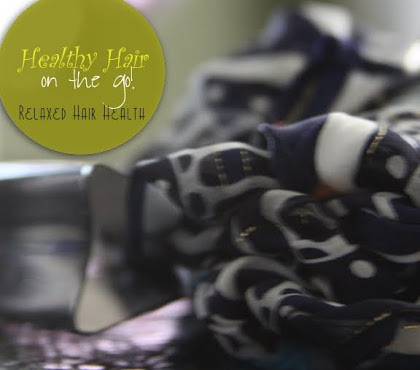 My end-in mind is to support my desire to have healthy looking hair everyday with consistent action. I'm excited to see what may come of this in the long run. 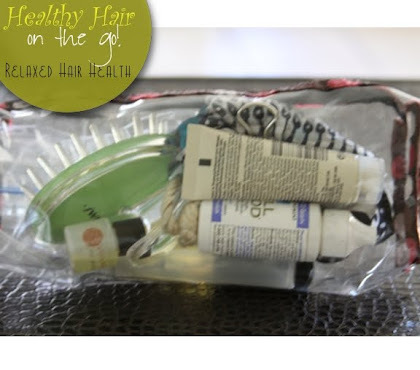 So tell me, what are your must have "healthy hair" items that you take with you wherever you go? WOW I love this! I keep saying I'm going to order a couple of the sample size from my fav line (Bee Mine) to keep in my purse and/or to travel with but I have yet to do so. Thanks for the ideas! This post made me realize that I need to do the same for my hair and make-up thank you! Excellent kit. I need to make one for my hair as well. 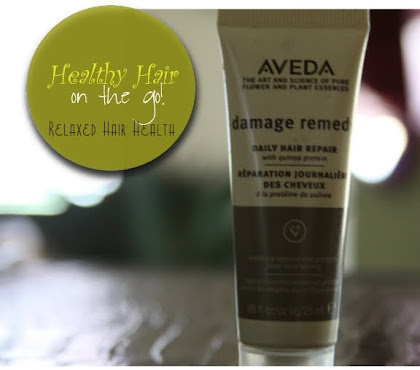 Thanks for the Aveda Daily Hair Repair tip! Whenever I travel, I have to carry my moisturizer, NTM silk touch leave in, a sealant-EVOO, a silk scarf, a wide tooth comb and goodie hair pins. Hi! I've been browsing your blog specifically for your posts on silica. I ordered a bottle of the Hubner gel about a month ago and just finished it. I'm wondering if you ever tried the cellfood silica gel, and if yes, which did you prefer? I haven't noticed groundbreaking results yet with the Hubner formula, which I find strange because so many reviews say they noticed a difference within a few days. Thanks! I haven't tried the Cell Food Silica (yet) but it's next on my list. I suspect the Cell Food version may be in liquid form so your body may absorb it better than the gel version.